A digital revolution is sweeping the global energy sector. As energy industries produce ever more data, firms are harnessing greater computing power, advances in data science, and increased digital connectivity to exploit that data. These trends have the potential to transform the way energy is produced, transported, and consumed. An important potential benefit of this digital transformation of energy is a reduction in global emissions of greenhouse gases that cause climate change; the elimination of such emissions from the global economy is known as decarbonization. By enabling clean energy systems that rely on low-carbon energy sources and are highly efficient in using energy, digital innovations in the energy sector can speed decarbonization. Yet they are not guaranteed to do so. In fact, digital innovations could well increase global greenhouse emissions, for example, by making it easier to extract fossil fuels. To determine the potential for digital technologies to speed a clean energy transition and to make recommendations to promote this outcome, the Council on Foreign Relations convened a workshop in New York, on February 22 and 23, 2018. Participants laid out a wide range of areas in which digital technologies are already enabling clean energy systems and could achieve much more; they also cautioned about serious risks that will attend the digitalization of energy and need to be managed; and they articulated actionable recommendations for policymakers in the United States and abroad to ensure that digital innovations bring societal benefits and, in particular, speed decarbonization. 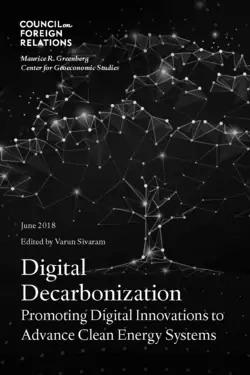 Digital Decarbonization summarizes the insights from this workshop and includes contributions from fourteen expert authors delving into these topics.